Santorini is hands-down one of the most romantic places we have ever visited. The iconic white-washed buildings with bright blue domes, the expansive Aegean Sea, the uniquely dramatic caldera vistas…it’s enough to make anyone swoon. On top of the picture-perfect views, Santorini also boasts world-renowned wineries and delectable local products—the perfect conditions for a wonderfully romantic five-course dinner. 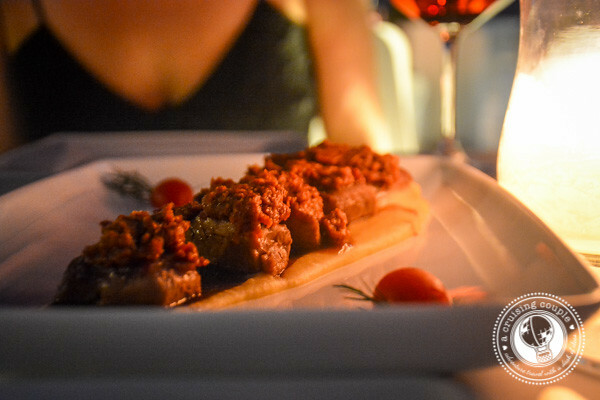 It had been a while since we’d dressed to impress and enjoyed fine dining, so our first night in Santorini we decided to join Gastronomy Santorini for one of their five-course tasting menus. The experience turned out to be so delightful—and the food so delicious—that we opted to do it again our final night in Santorini, too! 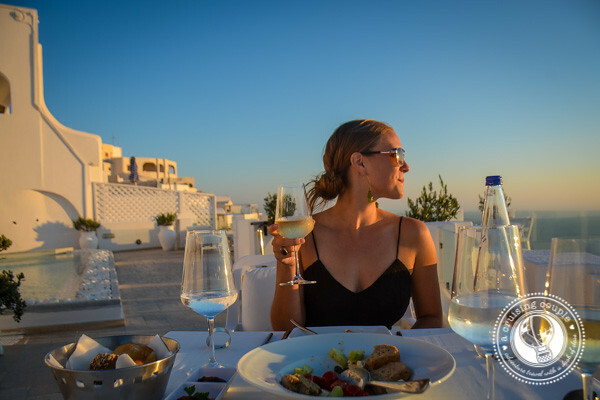 Both occasions with Gastronomy Santorini were absolute perfection, and easily some of the best food we indulged in during our entire thirty days in Greece. The five-course dinner is set at the restaurant of Above Blue Suites in Imervigoli. 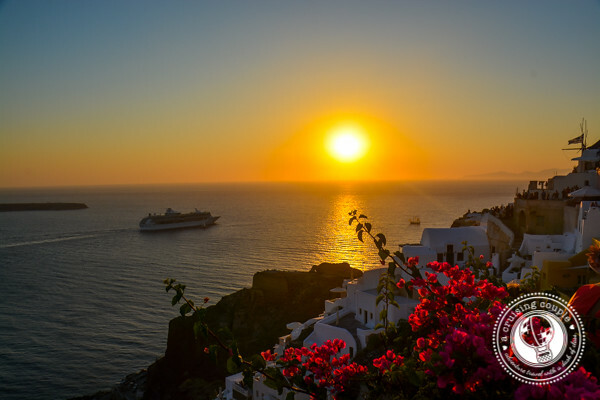 Imervigoli, in our opinion, is the absolute best place to watch the sun set in Santorini; a dinner here is worth it for the breathtaking views alone. If you head to Oia, Santorini’s most famous (and, as a result, most touristy) neighborhood to watch the sun go down, you’ll be dodging selfie sticks. At Above Blue Suites, we had nothing but tranquility, mouth-watering food, and, of course, a few glasses of wine to accompany our sweeping view. It seems so simple, but these fresh dips became my favorite thing to chow down on in Santorini. The Tomato Paste, in particular, is actually unique to Santorini as it is made from cherry tomatoes only produced on the island. These Santorini tomatoes have a full flavor and bright sweetness to them, especially delicious when combined with garlic, capers, oregano and oil for the iconic Santorini Tomato Paste. 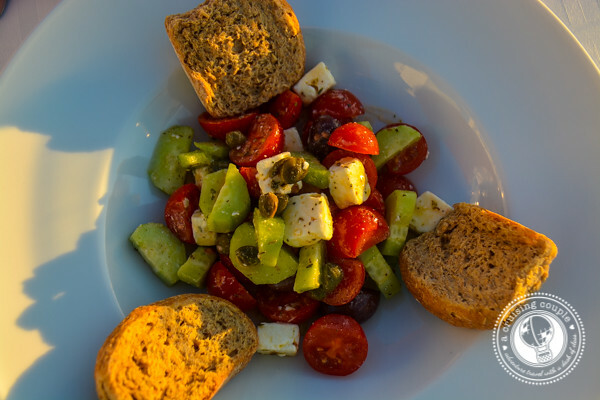 A local spin on the classic Greek salad, the Santorini salad consists of chloro cheese, Santorini tomatoes, cucumbers, bell peppers, red onion and capers. Tomato balls are a Santorini specialty, and no visit to the island is complete without giving them a try. 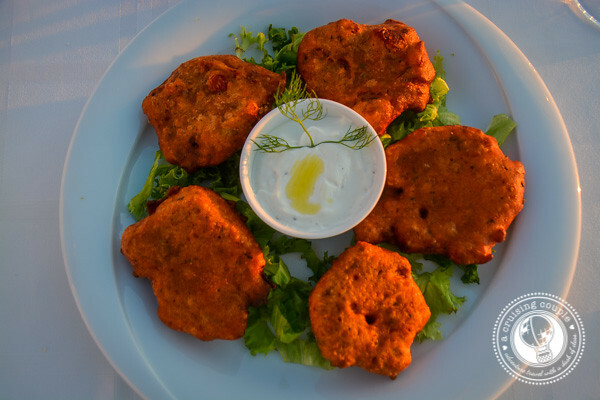 I’m typically not a huge fan of deep-fried foods, and unfortunately, many of the tomato balls we had at other restaurants around Santorini left something to be desired. But I was utterly obsessed with the tomato balls we had during our Gastronomy Five Courses Dinner. Light, crunchy and jam-packed with flavor, these fried critters were as delicious as could be—without the greasy, heavy feel that frequently accompanies fried food. Saganaki refers specifically to the small frying pan that the dish is cooked in. This shrimp saganaki was delightful, surprisingly fresh and light. Orzo has always been a favorite dish of mine, especially when it is rich and creamy. 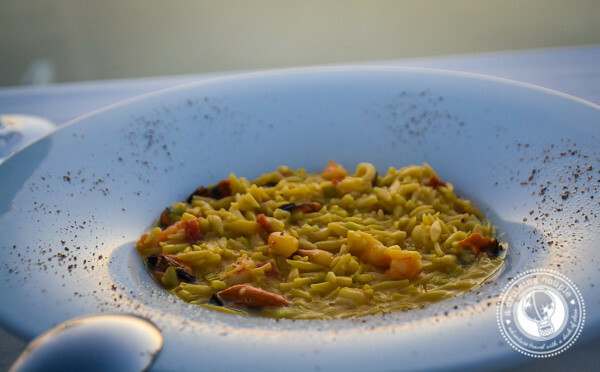 I had two particularly memorable orzo dishes in Greece. One was a mushroom and truffle oil orzo in Athens. The other was the shrimp orzo at our second five-course dinner. None of the other orzo dishes I had in Greece were bursting with nearly as much flavor as these. A brilliant combination of sweet and savory, this glazed pork was one of Dan’s favorite dishes. Fava bean dip is a typical Greek menu item and an absolute must-try. Similar to a yellow split-pea or hummus, fava dip is creamy dipping perfection. Layers of filo dough, delicious local honey and chopped nuts…need we even say more? 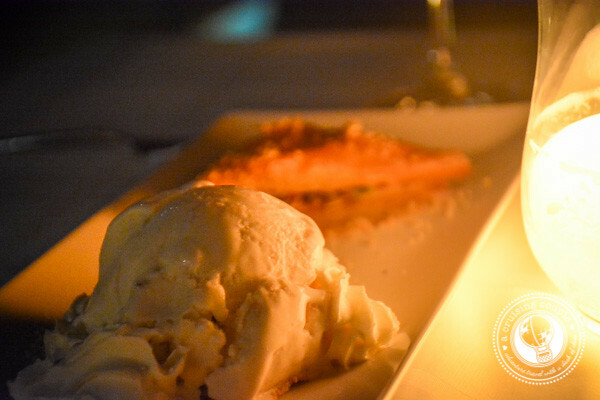 Baklava paired with ice cream must be one of the most fabulous ways to end any meal. 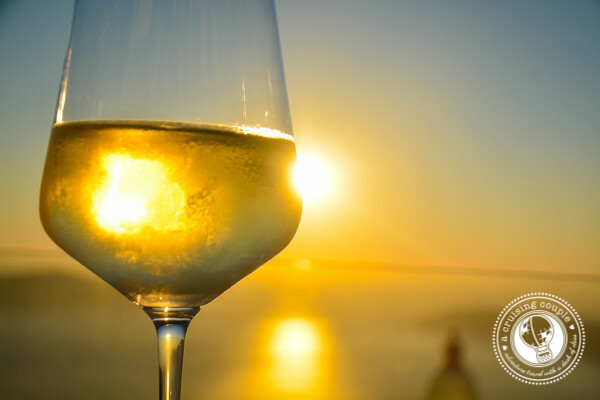 Of course, local Santorini wine is an absolute essential for any meal. Our dishes were paired with generous glasses of a white, a rose and a red wine. We’ll be writing an entire post that details the unique Greek wine making process. But for a sneak peek, Santorini wines are so delicious because of the unique volcanic ash and rock in the soil where the vines grow. The white Santorini wines were typically our favorite, but we enjoyed trying the different varieties throughout the duration of the dinner. After the three dry wines, a small glass of Vinsanto was served. Vinsanto is a sweet dessert wine made from the sun-dried Assyrtiko and Aidani grapes of Santorini. A good Vinsanto is superb. A bad Vinsanto…not so much. Luckily, the Vinsanto that ended our five-course dining experience was wonderful. 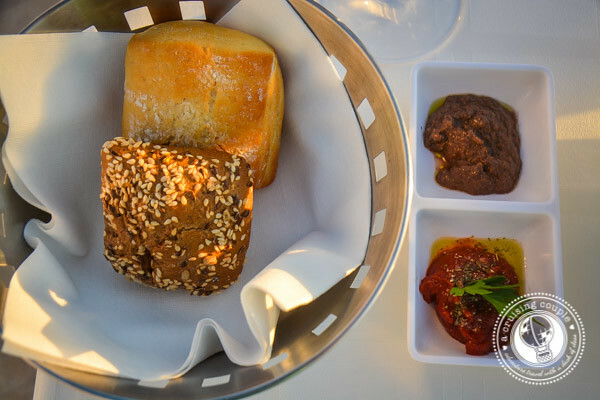 If you’re headed to Santorini, we highly recommend making a reservation with Gastronomy Santorini. 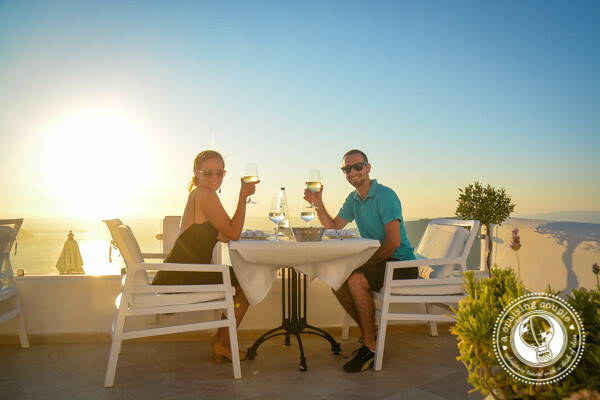 Not only is it a delicious and romantic experience, but it’s the perfect way to sample some of the most traditional, must-try Santorini dishes all in one spot. Have you been to Santorini? What has been your most memorable dining experience while traveling? We were guests of Gastonomy Santorini. As always, all thoughts and opinions remain our own. so… not too shabby then? Great post! I actually am headed to Santorini soon, how much is the 5 course dinner? and can you pick and choose the courses?